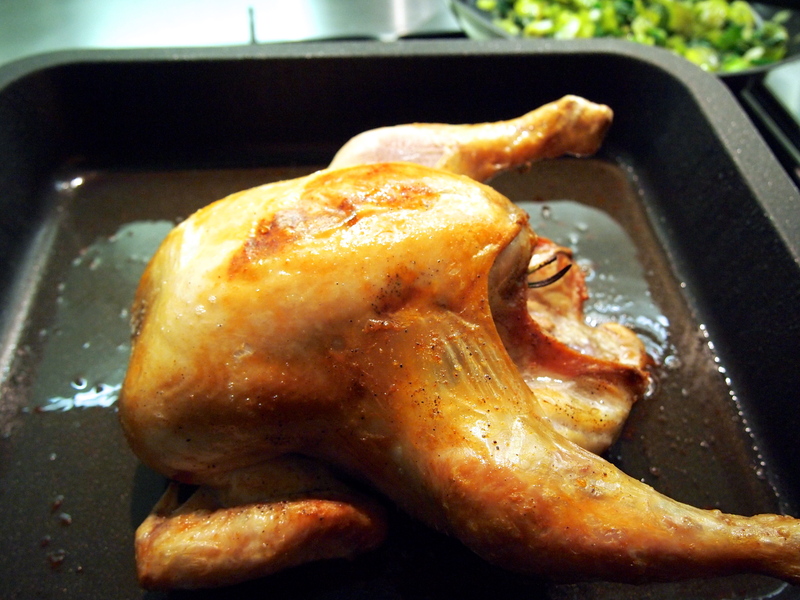 It never ceases to amaze me how many different methods there are for roasting a simple chook. Fast, slow, stuffed, marinated – the list goes on and on, and just to add to that list here is my new favourite. 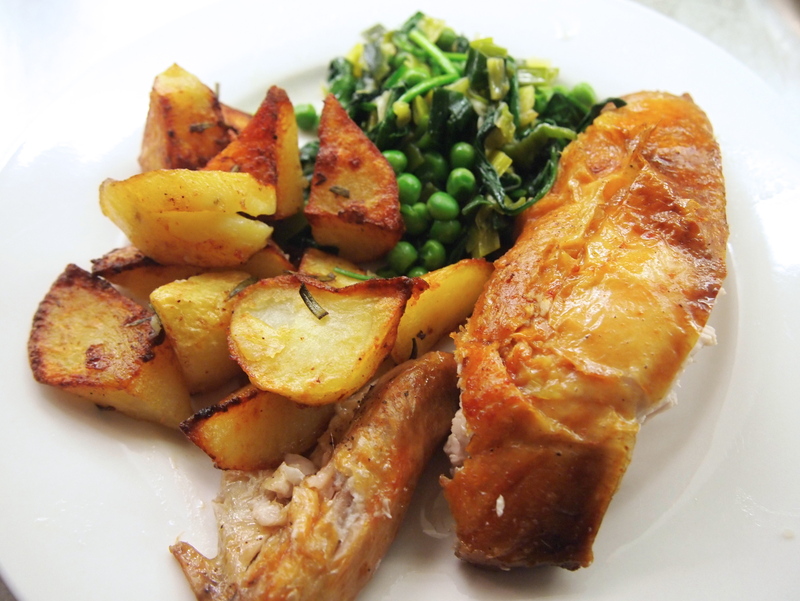 Italians have a way of roasting a chicken which is pretty simple and basic but what sets it apart is the way the potatoes are roasted in the same pan, soaking up all the chicken juices and fat and becoming not only wonderfully crisp but really flavourful. The chicken is stuffed with a lemon and some sprigs of rosemary and anointed with a good slathering of olive oil. It’s left to roast on its own for a while before the potatoes are introduced. They get a little more oil and a good stir around in all the lovely juices in the pan. It’s then back into the oven to finish roasting by which time the potatoes will be lovely and golden as will the bird. Simple but oh so good or as they say in Italy, bellissimo! Pat the chicken dry and bring to room temperature. Pre-heat oven to 200C (fan forced). Wash the peeled potatoes well and leave to soak in cold water – this will drain the excess starch from the potatoes making them extra crispy when they’re roasted. Stuff the chicken with the lemon halves and the three whole rosemary sprigs. Drizzle some olive oil onto the chicken and massage it all over the skin. Season generously with salt and pepper. 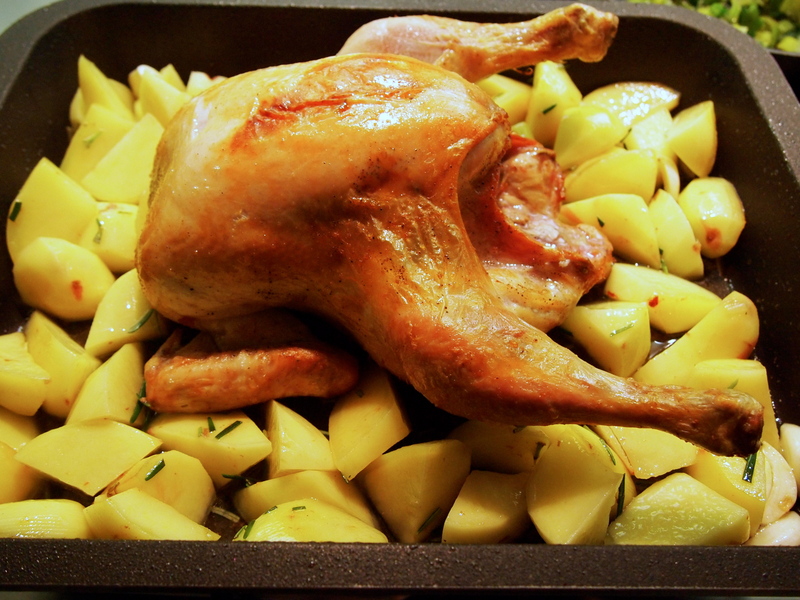 Place the chicken into a roasting tray that is large enough to accommodate both the chicken and the potatoes, which will be added later on. Place in the oven and roast for 30 minutes. Just before the 30 minutes is over, drain the potatoes and dry them throughly with kitchen paper. At the 30 minute mark remove the roasting tray from the oven and take out the chicken, tilting the chicken slightly so the juices in the cavity drip back into the pan. 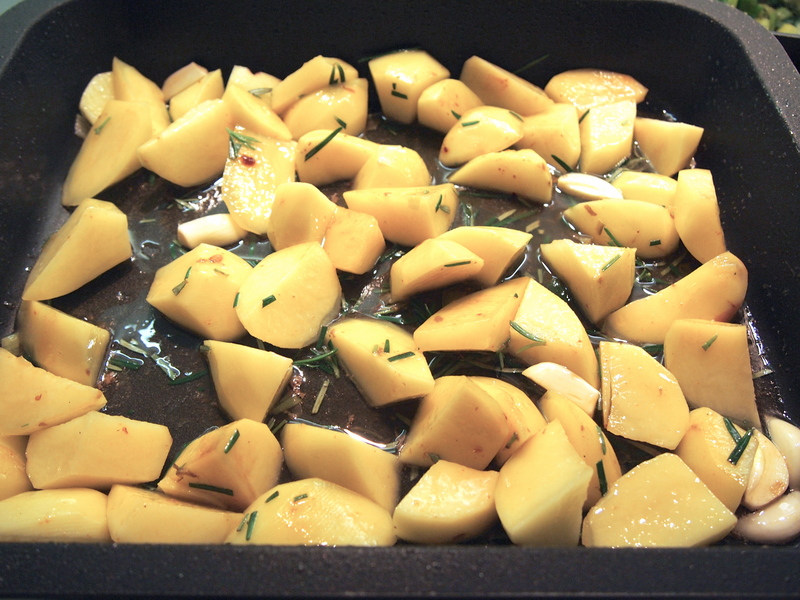 Add the potatoes to the roasting tray along with the remaining chopped rosemary and garlic. 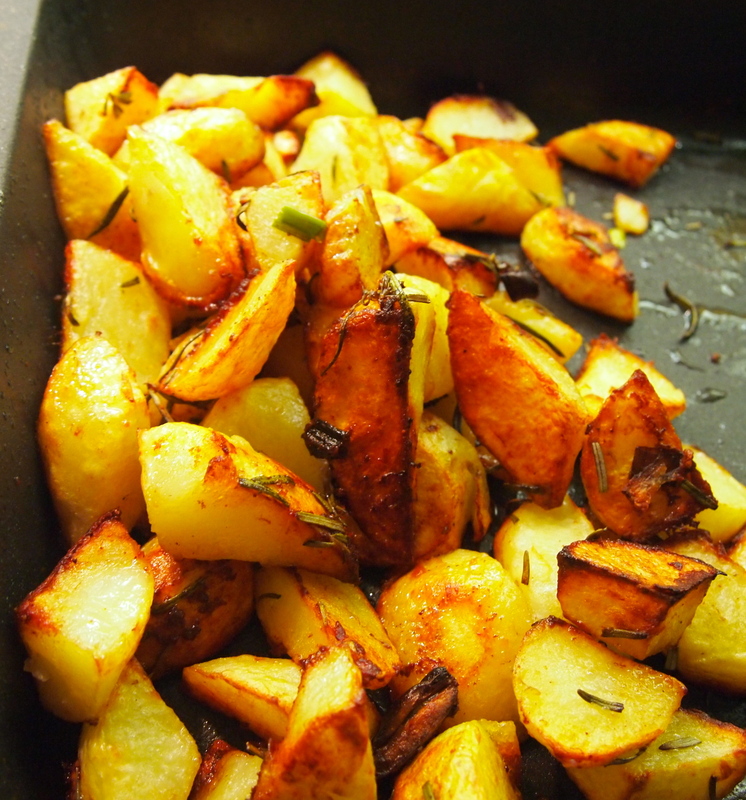 Season the potatoes with salt and add a small drizzle of olive oil. Toss the potatoes in the pan ensuring they are well coated with the pan juices and oil. 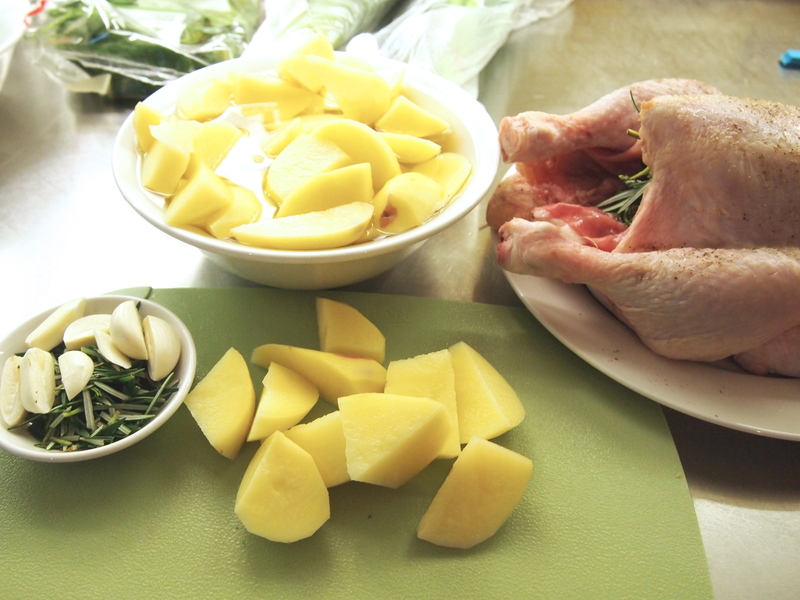 Shove the potatoes to the sides of the tray and return the chicken to the centre. Place the roasting tray back in the oven and cook for a further 30 – 40 minutes or until the chicken is golden and cooked through. Halfway through the cooking time give the potatoes a little toss around. When the chicken is done remove it from the pan and set it aside to rest, again tipping the juices in the cavity back into the pan. Give the potatoes another good toss and spread them out in the tray. Return to the oven and continue to roast while the chicken rests. I found that another 15 minutes was enough for the potatoes to be lovely and crisp but you can cook them for longer as the chicken can safely rest for up to 30 minutes. 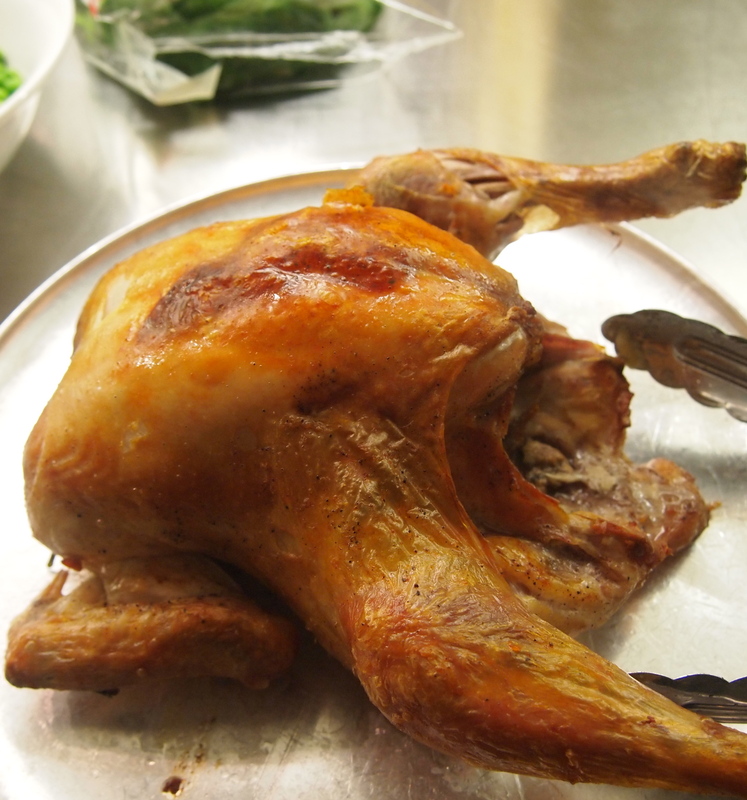 Carve the chicken and serve with the potatoes and some steamed greens or salad.